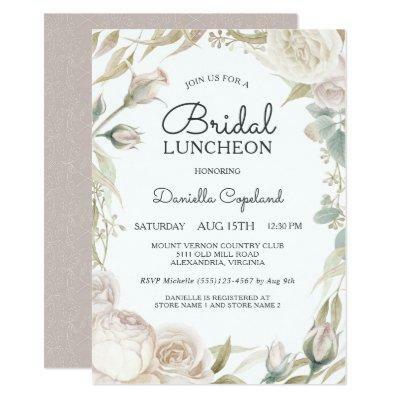 Elegant white roses, rosebuds and greenery surround your text beautifully with a floral frame in this lovely watercolor bridal luncheon invitation. If you wish to change the title text to a brunch or shower, simply edit the text accordingly. Personalize the details using the easy to use text template. You can move text around or add or remove lines of text as needed. Once you fill in the text template with your details, you can choose "customize further" to move the text, choose different fonts, etc.